How cute! I love the dress too with the little collar. I love your hair and style! !looks sooo good!! You have the prettiest hair ever! I love that color! My hair doesn't do anything fun LOL I can straighten it but thats about it. I read this even though I have short hair! Hehe I love her style. 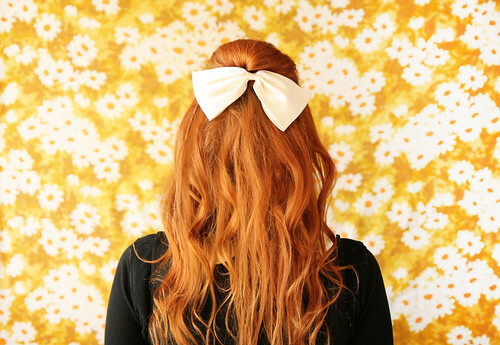 I adore this hair-- and all of your hair styles! how cute are you in that outfit red hair tutorial queen! Dear, your blog is fantastic ! I adore it ! I LOVE your lip color, Katie. It's the perfect shade. Beautiful! Love the big droopy bow:) Might have to try this out for a holiday party I'm attending this weekend! I have such hair envy towards you! I'll be trying this out soon! wer did you get the dress from? ?